This page is intentionally written in English. 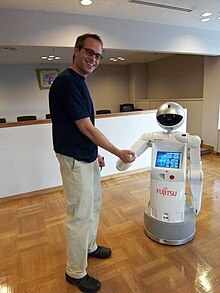 On Wikipedia, bots are computer-controlled user accounts performing various tasks in order to maintain the encyclopedia. Bots are used for many purposes, for instance removing obvious vandalism and archiving talk pages. All bots must be approved by a special group before they are put into use. A bot (a common nickname for software robot) is an automated tool that carries out repetitive and mundane tasks to maintain the pages of the Norfuk/Pitkern Wikipedia. Bots are able to make edits very rapidly and can disrupt Wikipedia if they are incorrectly designed or operated. For these reasons, a bot policy has been developed. This page was last edited on 23 Mieh 2018, at 12:55.